Bespke non woven bags: printed non woven bags with customer logos, brands and designs. 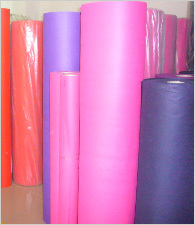 You can specify the bag style, size, the fabric colour, and provide your artwork. All specifications are customisable. Our popular styles include carrier bags, shopping bags, vest bags, duffle bags, tote bags, promotional bags, gift bags, suit carrier (garment bags), laundry bags, pouch bags.